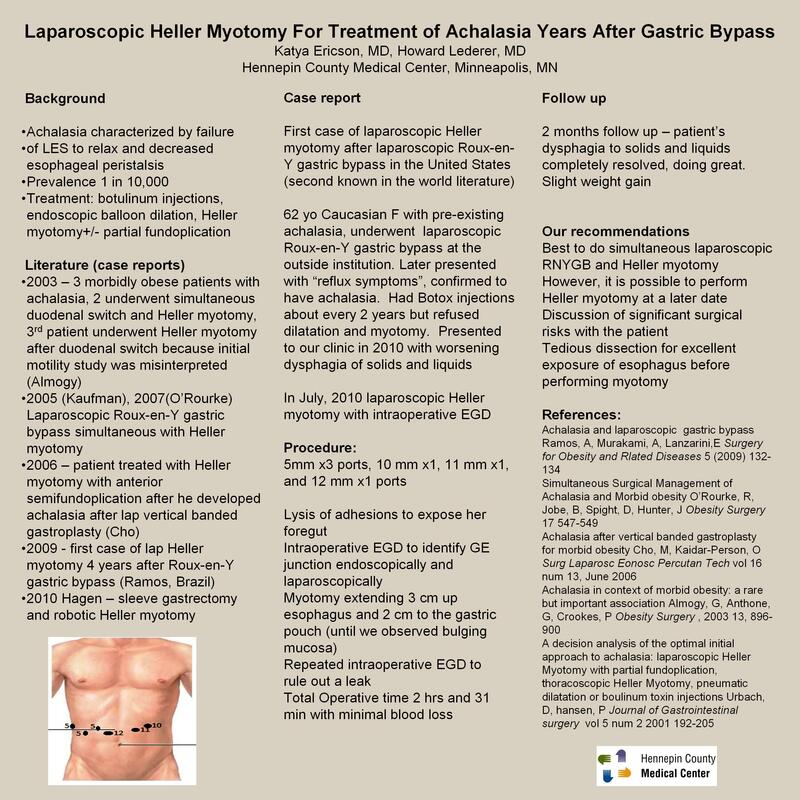 Laparoscopic Heller Myotomy is well described in the literature as a good surgical option for treatment of esophageal achalasia. There have been a number of case reports in the literature describing lap Heller myotomy done simultaneously with or after surgical procedures to treat obesity. We present the first case in the US, and the second in the world literature of a patient who underwent lap gastric bypass and years later was treated with Heller Myotomy. Chart review of single patient as well as a review of publicly available computer database. Our patient is a 62yo female who was diagnosed with achalasia in 1995 underwent open Roux-en-Y gastric bypass at an outside institution in 2001. For unknown reasons, her achalasia was not addressed prior to or at the time of her gastric bypass. After the bypass, her dysphagia has worsened. She was treated with botox injection but continued to have dysphagia to both liquids and solids. She was referred to our bariatric surgical team. After reviewing her upper GI that showed markedly dilated esophagus with abrupt short segment distal tapering consistent with achalasia, we offered her lap Heller myotomy and she elected to proceed. In July, 2010 we performed lap Heller myotomy that involved three 5 mm ports, one 10, 11, 12 mm ports. Our surgery involved tedious dissection of the foregut adhesions. Intraoperative EGD was performed to indentify GE junction both endoscopically and laparoscopically. We then incised the longitudinal and transverse esophageal muscle fibers until bulging mucosa was visualized, 3 cm proximal up esophagus and 2 cm distal to the gastroesophageal junction. Our operative time was 2 hrs and 31 minutes with minimal blood loss. The procedure was completed laparoscopically and patient was discharged home on post operative day #1. At 2 months follow up, she was tolerating regular diet with complete resolution of her dysphagia and no ill effects. One of the first reports addressing surgical treatment of achalasia in a bariatric patient was published in 2003 by Almogy who described 3 morbid obese patients who also had simultaneous achalasia. Two underwent simultaneous duodenal switch and Heller myotomy. The third patient underwent Heller myotomy after duodenal switch because initial motility study was misinterpreted. Kaufman et al first described lap RNYGB simultaneous with Heller myotomy in 2005. His results were later duplicated by O’Rourke. Then, in 2009 Ramos et al from Brazil described the first case of lap Heller myotomy four years after RNYGB. Cho from Cleveland Clinic in Florida described a patient who developed achalasia after laparoscopic vertical banded gastroplasty and was treated with Heller myotomy with anterior semifundoplication. And the latest report published was in 2010 by Hagen who performed simultaneous sleeve gastrectomy and robotic Heller myotomy. Here, we describe a case of lap Heller myotomy in a patient who underwent open RNYGB 9 years prior to this surgery. Laparoscopic Heller myotomy is a good surgical option for treatment of achalasia and should be done simultaneously with morbid obesity surgery.